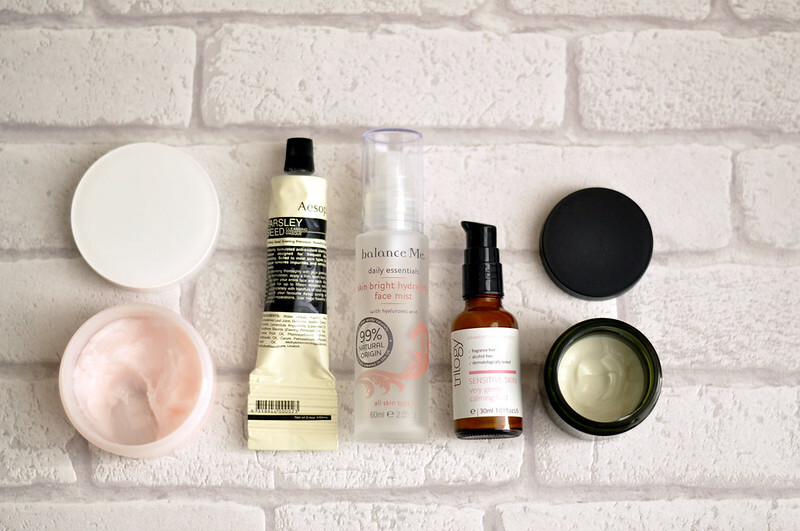 RMK Rose Cleansing Balm // Aesop Parsley Seed Cleansing Masque // balance Me Skin Bight Hydrating Face Mist // Trilogy Very Gentle Calming Fluid // Origins Mega Mushroom Skin Relief Soothing Face Cream. Not pictured - Garnier Micellar Water. For some reason I totally forgot to add this into the photo and thanks to bad lighting ever since I didn't want to retake the photo. This months skin care looks very much like last months and the month before that. Noticing a pattern here? I'm still just trying to use the same products until they're empty and then moving onto something else. I used to buy a new product every week, okay not literally every week but it certainly felt like it, use it for a couple of weeks and then try the next thing I'd just bought. I don't know if it's just that my mind set has changed or what but I just don't feel the need to try every single product that has either just been released or raved about by a blogger. Don't get me wrong I still get excited about everything to do with skin care and beauty but as far as my collection goes I'm tying to work it down to only having one or two products per category. The only change from last month is using a different moisturiser since I ran out of Caudalie Vinosource Moisturising Sorbet. A year or two ago I got a generous sample of the Origins Mega Mushroom moisturiser from a counter and it lasted about a month so I knew I definitely liked it and wanted to buy the full size which I did a few months later. For some reason though I'm just not liking it as much as I did when I tried the sample. I have dry skin and no matter how little I apply I just feel like it leaves a greasy layer on my skin which doesn't sink in. I'm a little over half way through the pot and am trying my best to finish it but I'm just not sure what changed about it. I am using a different serum now so I don't know if that is it. I was using the serum that goes with the moisturiser when I first tying it and which I have a full size of now as well so I might give the two another go. I hate when the full product isn't as good as the sample! I love the Aesop mask, I've used countless samples and have loved it every time!